Margi is an Illinois multimedia artist working predominantly in watercolor and collage. To read more about this year’s 17th Regional Judied Exhibition judge go Margi’s website, margihafer.com. Notices of Juror's selections go out by email or mail if SASE is submitted. All work that is not selected must be picked up during regular hours or will be shipped with prepaid return postage. Opening reception, 2:00-4:00pm. Awards presented. Pick-up work during business hours or will be shipped if prepaid return postage is included. Only cash, checks and money orders will be accepted. Payment must accompany all entries, along with completed entry form, entry labels, notification card and self-addressed, stamped envelope. Work must be delivered for judging to the Chesterton Art Center on Monday, August 28th 11:00 am-4:00 pm or Tuesday, August 29th 11:00am-7:00 pm. Shipped work must be packed in a secure, re-usable box or crate and insured with return shipment pre-paid. Hand delivery is strongly recommended for fragile pieces, especially sculpture. • Entries that are not accepted will be available for pick-up at the gallery Saturday, September 2 during regular business hours. • Exhibited art will be available for pick-up at the gallery September 30 during regular business hours, or will be shipped if return shipping was provided. 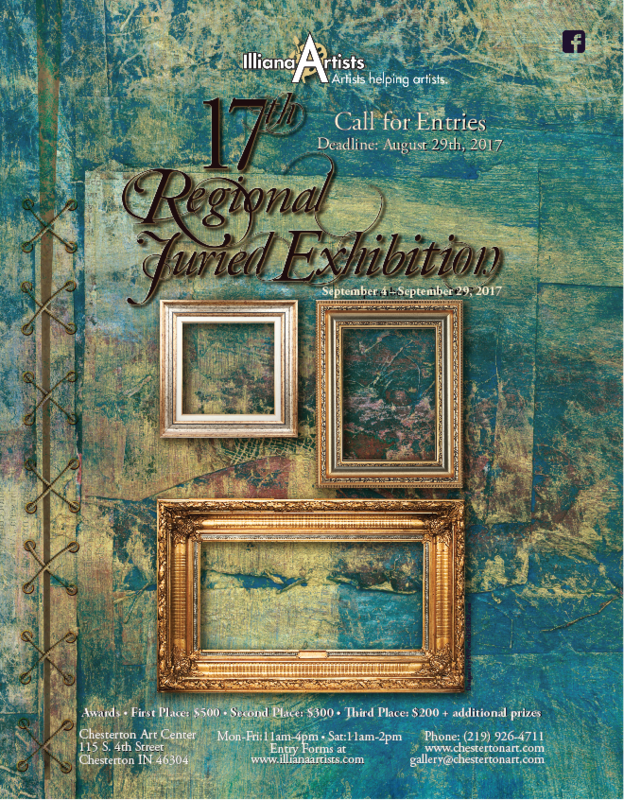 This is a regional juried exhibition and open to artists 18 years and older living in Illinois, Indiana, and Michigan. • All 2-D and 3-D fine art media are accepted (e.g. sculpture, glass work, oil, acrylic, watercolor, mixed media, photography, pastel, and drawing. No vector computer art or crafts. • All 3-D work must be sculptural, hand-crafted, or completely unique in design and execution. Work must be no more than two years old. All entries must be original concept and execution of the artist. No copies or prints of paintings, published photographs or other artist’s work will be accepted. No work done in class or under the tutelage of an instructor is eligible for entry, nor wet paintings, or work previously exhibited with either the Chesterton Art Center or Illiana Artists. • 2-D works must be either gallery wrapped (finished edges and no exposed stables) or framed, and ready to hang with picture wire and eyelets (no saw-tooth). No entered work framed work not to exceed 100" (top, bottom, left, and right) and not to exceed 10 pounds. Plexiglas is preferred, especially for large pieces. Glass is acceptable for hand-delivered work only. White or neutral top mats are preferred. • All freestanding sculptures must have a base and pedestal. commission will be retained for all work sold. • All entries must be ready for installation, but artist’s will not be permitted on installation day.